Read our release notes about the latest features and improvements. This maintenance release includes fixes to Reports. Chat reports now exclude chats assigned to the bot when no custom operator filters are defined. By default, no custom operator filters are selected, therefore, the bot is excluded from chat reports. Note: A chat is only assigned to the bot if the customer did not escalate the chat to a live agent. Previously, these reports included the bot as an operator by default. From this release, chats assigned to the bot are excluded even if you do not apply any filtering on the reports. 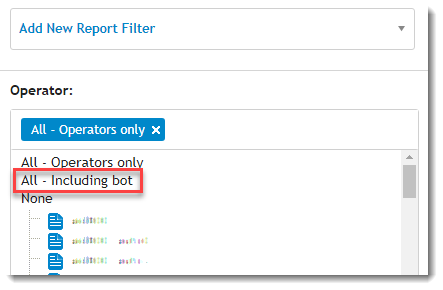 To include bot sessions, select the All - Including bot operator filter from the advanced report settings. For more information on reports including the bot, see Chat reports involving a chatbot. This maintenance release includes enhancements and fixes to the Agent Workspace and the chat window. Supervisors can now transfer chats from the bot to a live agent without the customer's request. These transfers are shown in reports as any other agent to agent transfer. For more information, see Transfer a chat and Monitor the chats of your organization. You can collaborate with another agent in your organization to help you resolve a specific customer issue while chatting with the customer. For more information, see Discuss a customer's issue with another agent. During a discussion, you can join the original agent's chat to help resolve the customer's issue. To do so, click Join Chat at the bottom of the Discussion panel or from Monitor View. For more information, see Join a chat during internal discussion. You can customize the default view on your workspace so that when you open a new chat or message, the same panels are displayed. See Customize the default Agent view. When you transfer a chat to an agent or start a discussion, you can see the number of tasks that other agent's currently work on next to their name. This gives you a hint whether the other person can take additional workload. See Transfer a chat. You can now define a separate knowledge base for your customers and agents. This way, you can define an additional knowledge base that agents can use when the bot does not find a suitable answer. Since the bot is continuously listening and suggesting answers, using a separate knowledge would allow you to differentiate between answers that the bot offered to customers vs agents. To define a separate knowledge base, in the Admin Center, go to Channels > Chat > Chat Windows and on the General tab, select a knowledge base for your agents. For more information about these features, visit the Bold360 ai support site. The Canned Messages and the Smart Advisor panels are now simultaneously available in the Agent Workspace for chats that were transferred from the bot. The combined Bold360 ai Mobile SDK has been introduced for developers. For more information, see the Bold360 and BoldChat Develpoer Center. Stabilization improvements have been implemented for Co-browse to make it more robust. This maintenance release includes enhancements and fixes to the Agent Workspace. An Initial question column has been added to display the customer's first question on the Queued tab. Based on this information, supervisors can transfer the chat to the most suitable agent. Click the arrow in the-top left corner of the agent workspace above your list of sessions. Select Email from the Channels drop-down list. Emails are grouped on the Queue, Assigned to Agent and Closed tabs. For more information, see Monitor the emails of your organization. You can set up warnings that signal issues with chats and email messages. For more information, see Monitor the chats of your organization and Monitor the emails of your organization. A warning is displayed at the top of the Agent Workspace when the agent is disconnected from the chat session. While disconnected, the agent can type messages to the customer and when the issue is resolved, all messages are sent instantly. Note: The customer is not notified about the disconnection. Several performance improvements to the overall agent experience have been introduced when working with multiple items in the agent workspace. You can display proactive chat invitations, even when only the bot is available for chat in your organization. In the Admin Center, go to Customers > Invitation Rule Sets and select an invitation rule. If you do not have rules set up then go to Customers > Invitation Settings. Select Show invitation even when agents are unavailable/offline. This maintenance release includes enhancements and fixes to the Agent Workspace and reports. When a customer chats with a bot, the customer may select an option that the bot offers, such as a product or an article. When the chat is transferred to a live agent, the selected option is displayed in a more user friendly manner in the Agent Workspace. This maintenance release features improvements and fixes to the Agent Workspace and the Admin Center. See Monitor the chats of your organization. From AI-enabled chat windows, agents can now transfer files to customers. See Activate a chat. This major release introduces Bold360 ai, which offers conversational chatbots, seamless transition between chatbots and agents, agent facing intelligent automation via the Smart Advisor, and a full suite of other self-service capabilities and analytics. In addition, Bold360 customers can monitor active and queued chats in a brand new view added to the Agent Workspace. The release includes a number of other improvements and fixes to the Agent Workspace and Admin Center. Agents can use the Smart Advisor panel to get AI-assisted help from the Bold360 ai chatbot. See Smart Advisor: Chatbot-assisted conversations. Agents can monitor the chats of their organizations. See Monitor the chats of your organization. The Bold360 ai integration provides AI-assisted help for customers and agents. For information on the integration, see Bold360 ai setup. This maintenance release features a number of improvements and fixes to the Agent Workspace, the Admin Center, and reports. Agents can start PIN-based co-browse sessions with customers. For more information, see Start a PIN-based co-browse session. Agents can start view-only co-browse sessions with customers, where agents cannot interact directly with the customer's screen, but they can see what the customer is doing. For more information, see Setting up your website for co-browse sessions. Post-conversation wrap-up fields are available for SMS and Facebook messages. Agents can start the next queued chat by clicking Take next queued chat in the Agent Workspace. This allows agents to start additional conversations even when their concurrent limit is reached. You can change the default permission group for new Bold360 users. All users created subsequently will be members of that permission group. For more information, see Set agent permissions: Assign an agent to a permission group. The Website and Chat Window fields are now marked as required on the Customers > Pin Invitations page. The Admin Center was unresponsive for a few seconds after you saved the details of a Facebook Messenger account. This major release introduces full account configuration and management in the Bold360 Admin Center. Bold360 admins and managers can now set up and manage their account in the Admin Center. Most features formerly available only in the BoldChat Desktop Client are now available on the web at admin.bold360.com. Find what you're looking for using the full-text search in the top-left corner of the Admin Center: "Where can I find..."
This is the initial general release of Bold360. Welcome to Bold360, your one-stop-shop for chat, email, message management, remote access, and co-browse.